Abstract: There are unique challenges in sustainability education that many in administrative and decision-making positions may not fully understand. While there is a general movement toward interdisciplinary curriculum design in colleges and universities, what may truly be needed to effectively address sustainability issues is trans-disciplinary curriculum design. 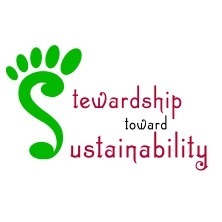 Using my experience in creating the Stewardship Toward Sustainability certificate program at Ferrum College as a launch point, I discuss solutions to overcoming conceptual and political barriers in this process. Introducing any new curricula can be difficult, but addressing sustainability presents truly unique challenges as it is a broad topic with significant influences from natural sciences, social sciences, and the humanities alike. Effective sustainability curriculum must reflect and draw on this varied terrain to go beyond interdisciplinary study toward transdisciplinary exploration. Interdisciplinarity, while a step in the right direction, maintains the boundaries that traditionally exist between fields of study further exacerbating the siloing of knowledge for students. Transdisciplinarity seeks “unity of knowledge beyond disciplines…its approach implies full interaction between, among, and beyond disciplines from a real-life problem-based perspective” (Hyun, 2011). The complexity of issues addressed within sustainability education demand such an approach yet, higher education is slow to adopt this new paradigm. The challenge for sustainability educators in higher education is to bring forth transdisciplinary curriculum within an academic environment which may be reluctant to accept this emerging paradigm. To explore this process, I reflect on my journey of creating the Stewardship toward Sustainability certificate program at Ferrum College. I briefly describe its development over a two year germination period and curriculum design process that resulted in final approval in spring of 2012. I do not delve into the philosophical tenets of the certificate but rather examine the curriculum proposal process with particular attention on the value of backward design for sustainability education curriculum design. I also consider the political realities of proposing any new curriculum and describe how I navigated this terrain. These two dimensions are intermingled as the story unfolds. Ferrum College is located in the foothills of the Appalachian Mountains of Virginia. It is a rural, liberal arts institution with around 1300 undergraduate students. Like many colleges and universities, Ferrum is organized into three schools – Social Sciences and Professional Studies, Natural Sciences and Mathematics, and Arts and Humanities – each housing a variety of related majors. I teach in Recreation Leadership which is housed in Social Sciences and Professional Studies. In recent years, academic certificate programs have been promoted by the college’s leadership as a viable way of creating interdisciplinary curriculum. While majors and minors explore a particular field in depth, certificates consider overarching topics across disciplines. By design, they are interdisciplinary meaning they engage multiple perspectives in the form of coursework from a variety of fields of study that are then applied to a particular ‘big question.’ For example, at Ferrum, the Appalachian cluster focuses on issues specific to the Appalachian region of the east coast of the United States such as the eco-social impact of mountaintop removal coal mining. The three introductory level courses include sociology, college writing, and environmental science. The instructors plan the courses together with projects that cross over and a culminating field trip to a small town in West Virginia devastated by the effects of mountaintop removal. Even so, the courses maintain their unique pedagogy driven by each respective discipline. The limitation of an interdisciplinary approach is that courses continue to be taught as disparate content areas. Students are expected to draw connections and meaning between these content areas. However, sustainability may demand a transdisciplinary approach to curriculum in which the big questions drive the exploration regardless of specific content areas. In fall of 2009, I had several discussions with faculty members in the Environmental Sciences as well as a few with English concerning the need for an Environmental Stewardship certificate at Ferrum College. A regular theme in these discussions concerned the value of students pursuing a mixture of Environmental Science, Recreation Leadership, Education, Literature, and Sociology to better prepare them for a wide range of careers. Many students were (and still are) passionate about their commitment to the environment, but within their respective majors and minors, no clear connection to environmental stewardship existed. Adding to the challenge, each of the schools – Social Sciences, Natural Sciences, and Arts & Humanities – has their own expectations down to the approved writing style within each. These discussions intensified in the spring of 2010 such that I felt there was enough support for a certificate to be introduced to address this gap. In the fall of 2010, I started my studies in the PhD program in Sustainability Education at Prescott College. In the core immersion courses, I learned about the challenges in all levels of education with fragmented and often disparate teaching and learning methods that are in need of reform. Further, I was intrigued by the possibility of sustainability connecting the various disciplines in meaningful ways for both educators and learners. The complexity of the challenges facing humanity and our actions affecting every part of the biosphere transcends any one discipline of study. Curricula, then, should examine these issues from a multitude of perspectives and apply knowledge from multiple disciplines to creatively address the complex challenges of our time (Adams, 2010; Potter, 2010; Sterling, 2009). We left that meeting with a clear understanding of the overall direction of the design process and a rough outline of the key elements. We also generated a list of faculty from all three schools that may be interested in helping to create this curriculum. Faculty members were identified based upon the courses they taught and their overall history at Ferrum. The list of nearly twenty faculty members was heavy in the natural sciences and lite in the humanities with social sciences in between. It was critical to me that we invite participation from as many stakeholders as possible as I was starting to see the curriculum as something very unique. I inherently knew that it needed to emerge into the fullest of light or it would die quickly because of its uniqueness. To give it the best chance of success, I wanted – in fact needed – advocates from all over campus that understood at a fundamental level what I was trying to create and how they fit. Also, the wealth of knowledge both academically and institutionally that I was then able to draw on was invaluable moving forward. By spring of 2011, I had a much clearer picture of what this certificate should look like. The scope expanded from promoting environmental stewardship to promoting sustainability through stewardship. This was a big shift that addressed what I felt was missing all along, namely, a broader purpose for which to practice stewardship. In January 2011, I sent an invitation to the identified faculty to participate in a discussion forum. I provided a position statement intended to frame the concepts of environmental stewardship as well as sustainability and therefore, the conversation. I also included the Provost in the email to keep her aware of the process and progress. It was nice to receive an email of support from her on the project. I think it also sent a very clear message to the faculty involved that this is not just one faculty member’s idea but rather was supported by the institution making it easier for them to support and advocate for when the time came. I scheduled two meetings at different times of the week so that faculty could determine which fit their schedule best. During both meetings, I introduced a tool that Abigail Lynam, a colleague at Prescott College, designed. This tool applies the four quadrants of Integral Theory specifically to environmental education curriculum. 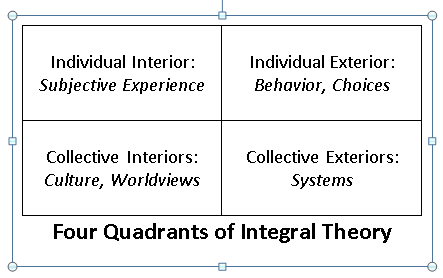 Integral Theory holds that in order for any issue or topic to be understood as fully as possible, it must be considered from four perspectives; individual interior, individual exterior, collective interior, and collective exterior (Wilbur, 2001). It is often presented as a two by two grid like the diagram above. In the Self-Assessment Analysis Tool developed by Abigail, each quadrant contains questions relevant to environmental education from the perspective of that quadrant. It proved incredibly simple to use and effective in analyzing existing courses. Prior to the meeting, I went through the college catalogue and considered each course based on the catalogue description and placed appropriate courses in the relevant quadrant(s). In the meetings, I explained the Self-Assessment Analysis Tool and how it influenced my analysis of the current course catalogue relevant to the concepts of environmental stewardship and sustainability. I then sought input on both the accuracy of my analysis as well as other courses that I overlooked. I stressed that only courses that fit within one of these four dimensions and related to stewardship or sustainability as I had defined them should be considered thus preventing the tendency to simply list a course to increase enrollment. The Self-Assessment Analysis Tool helped give direction to these crucial meeting and ground the analysis in a clearly defined method. It was also very helpful in conceptualizing courses needed to address the gaps, particularly related to the interior individual and interior collective dimensions. The faculty members were very receptive to the Self-Assessment Analysis Tool as they immediately understood its intended purpose. They most appreciated the structure and clarity that it provided. I was concerned about their acceptance of the interior aspects that it addressed but was pleasantly surprised when several within the sciences expressed the importance of these dimensions in being effective scientist. They were also not surprised by the lack of courses that addressed the individual interior. When asked about this, they readily admitted that higher education was not traditionally focused on cultivating the inner life of students and yet many felt that this lack of inner depth was a major barrier to effective learning for the students. It is only in retrospect that I clearly see the larger value to these steps and tools even though my gut told me I needed them at the time. At times, I felt like I was using the Self-Assessment Analysis Tool as a crutch and kept trying to put it aside. But each time I returned to it, it illuminated some other piece. So in reality, it was more like a walking stick in that it was there for major support when needed but otherwise served to keep a good pace. In fact, the final curriculum mirrors the four quadrants very clearly. In the meetings, I went in with a basic introduction and let the group direct where we went while I simply got out of the way, took notes, and drew us back when we went on tangents. I was not able to pick the project back up again until the summer of 2011. At that time, I integrated the concept of biocultural diversity which maintains that humans and ecosystems co-evolve and are dependent upon each other. This expanded the application of stewardship beyond the natural environment to include the people that rely on a given ecosystem. Adding this dimension rounded out the theories upon which the curriculum was ultimately based. It also influenced a name change to Biocultural Stewardship toward Sustainability, although the word biocultural was eventually dropped because the name simply grew too long and caused confusion. I now felt that I had all of the theoretical underpinnings clarified. I found myself asking a critical question in the development of any curriculum. How do I operationalize these theories into reasonable and engaging learning experiences that students can understand and see connection with their lives? It was time to develop the curriculum. In early August 2011, I met with the School of Social Science representative to Curriculum Committee seeking advice on how to proceed. She clarified which format I should use, reviewed key components, and how the process and timeline worked. We also reviewed the proposal so far. Even though I felt confident in the purpose of the certificate and the underlying principles, I felt overwhelmed by the magnitude of building it into a viable curriculum that made sense to students and faculty alike. So I looked around for help, took deep breath and moved forward. I met with the Dean of Academic Affairs to gain some clarity and support. Through this discussion, I decided that I needed to at least put forth a concept paper to each of the schools during the annual fall retreats to lay the ground work for the formal proposal. I sought advocates from each of the schools from the faculty who were already involved, met with each of them and explained the concepts so that they could discuss it within their respective schools. The feedback I received from my school was generally positive but also poked lots of holes related to justifications, supporting evidence, and learning outcomes. A key group of questions related to the value of the certificate to the students. Would it give them an edge in getting a job? What is the value of this type of certificate in the job market? Ultimately, why would a student opt to complete the certificate? Another specific question concerned how it related to the student learning outcomes laid out by the college. Was it linked in the same way as majors and the core curriculum of the college? If so, how would it be assessed? I received generally the same feedback from the other two schools. This feedback, even though tied to a generally positive reception, added to my confusion in how to make it all fit together into a functioning curriculum. During my presentation at the School of Social Sciences retreat, the Director of Teacher Education recognized my ‘deer in headlights’ look and graciously offered to help me work through the process of building the curriculum properly. Using the process of backward design, she helped me clarify learning outcomes and figure out assessment strategies. I also met again with the Dean of Academic Affairs who helped me fully utilize a Curriculum Alignment Matrix (CAM) which the college uses to demonstrate connections between college learning outcomes, program learning outcomes, and course learning outcomes. Through these processes, I was able to ground and operationalize the curriculum. Finally approval of the Stewardship Towards Sustainability certificate was granted by unanimous approval of the faculty in the spring of 2012. I taught the first transdisciplinary course with eight students who were amazed that teaching and learning could occur in such a dynamic and enriching way. It was one of the most rewarding courses I have ever taught and am excited to teach it again. While I would like to say that the Stewardship Towards Sustainability curriculum is fully transdisciplinary, it is primarily interdisciplinary with two new courses that take a transdisciplinary approach. Taking the long view, this is a step in the long process of continual change at Ferrum and indeed all of higher education. I had an interesting realization during the process of designing this curriculum. I would like to say that curriculum design is free of any a political process; however, that is naively idealistic. In fact, curriculum design and the politics of the culture in which the curriculum exists are so intimately intertwined, they are inseparable. Is curriculum not a direct reflection of society’s norms, hopes, and expectations? And is politics not the agreed upon structure by which society functions? This ultimately begs the question – What is the purpose of education? The intent here is to simply highlight that the question exists. Without recognizing this question and the resulting entanglement of education and politics, this process would be exponentially harder. Systems theory predicts that systems seek homeostasis and it is from within this state that new structures emerge. But when a new structure is thrust upon a system, the system resists that challenge (Wilbur, 2001). In this case, homeostasis is maintained by the political environment while the curriculum design process serves to bring forth new emergent qualities. A healthy political environment such as exists at Ferrum, supports and nurtures new curriculum. While my experience was generally very positive, it easily could have been difficult if the political environment where altered or if even one key player were missing or unsupportive. Adams, A. (2010). Integral education for a conscious evolution. ReVision, 32(1), 2-6. Hyun, E. (2011). Transdisciplinary higher education curriculum: A complicated cultural artifact. Research in Higher Education Journal, 11, 1. Sterling, S. (2009). Sustainable education: Re-visioning learning and change. Briston, United Kingdom: Green Books Ltd.
Wilbur, K. (2001). A theory of everything: An integral vision for business, politics, science, and spirituality. Boston, MA: Shambhala Publications.